I have a CAS US civil war heavy saber. These types of sabers were imported from England for use by the forces of the Confederate states during the US civil war. 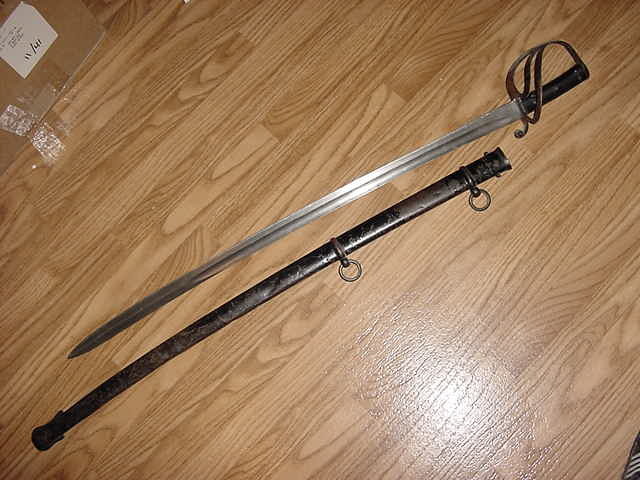 This sword is in great condition and has been hanging on my wall for close to 20-years. Now it needs a good home. The handle is heavy leather slabs riveted to the full tang. The 35" blade has a fuller on either side of the blade. The scabbard is metal. Please add the suffix to your title as per the Marketplace Rules. You do not need to post a response, but merely add the suffix. guess it helps to re-read the instructions. I could find how to do that when I looked for it before.